OKANOGAN, Wash. – When Colette Jones left full-time work as a hair stylist in 2007 to pursue a career in custom clothing design, few would have predicted that five years later she’d own her own upscale beauty salon and spa – with retail space for boutique clothing. “Building this business has been quite the process,” she said with a laugh. The name and décor at GiddyUp Salon and Spa pay tribute to Okanogan’s western heritage, but the hairstyles are contemporary and, when the client is willing, even a little edgy. Following her passion from hair design to clothing design and then back to hair – but this time as a shop owner – has been creatively and professionally satisfying, Jones said, but it wasn’t always profitable. She said she has been fortunate to have Lew Blakeney, a certified business advisor with the Washington Small Business Development Center (SBDC), just a phone call away. The SBDC provides confidential, one-on-one advising to small business owners who want to start, grow or transition their business. In 2013, SBDC advisors in the state met with more than 13,000 small business owners to help them achieve their goals. The SBDC receives support from Washington State University, the U.S. Small Business Administration and other institutions of higher education and economic development. In Okanogan County, the SBDC is supported by the Economic Alliance. Jones credits Blakeney with helping her stay solvent during lean times while building a business plan that works for her creatively and financially. “Lew helped me be wiser and smaller in my decisions,” she said. “If I didn’t have the means to pay for it, I didn’t get it.” That said, Jones didn’t give up on her dreams; she worked with Blakeney to create a sustainable plan to achieve them. Her first dream was to become a hair stylist, but after about a decade of working in someone else’s salon she wanted a new artistic challenge. In 2007, she pursued a career that previously had been a hobby: designing and making custom western wear, primarily for rodeo competitions and pageants. “I thought, ‘If I make this stuff, then I’ll sell it and I’ll pay off my debt,’” Jones said, but it wasn’t that easy. Her clients loved the clothes, but the expenses – for fabric, notions, trade show fees – added up faster than the revenue. Hearing of her struggles, her sister-in-law suggested she meet with Blakeney at the Omak, Wash., SBDC. Since SBDC advising is provided at no cost to business owners, Jones figured she had nothing to lose. Together she and Blakeney created a business plan that focused on custom clothing with a higher profit margin, but it was still a struggle. In late 2008, she went back to the drawing board. Her new business plan focused on her first love – hair design. Intending to start small, she wanted to rent a station from someone else but couldn’t find any openings. So, in 2009, she opened her own salon, doing hair in a 200 sq. ft. showroom. Fast-forward four years and Jones has a salon that’s 1,500 sq. ft. with a part-time massage therapist, a part-time aesthetician and stations for two stylists. She plans to add two more hair stations and chairs for manicures and pedicures. The salon also has retail space for boutique clothing and accessories. “Great things can’t happen without growth,” Jones said, but growth can be scary, too. She credits Blakeney with helping her step out of her comfort zone, find a new normal and then take another step forward. Along with building her business acumen, Jones has been keeping up with hair design trends at professional development seminars, including two 12-week sessions with Sonna Brado in Spokane. “While there I also did several sessions with a life coach who helped me refine my vision for my salon and plan for future growth,” Jones said. In addition to offering clients great cuts, color and styling, she also wants GiddyUp Salon and Spa to be a center for professional development for stylists in north central Washington. “I want to offer something no other salon in our area offers: continuing education, both for the young stylists right out of school and for the experienced stylists who want to take their careers to the next level,” she said. 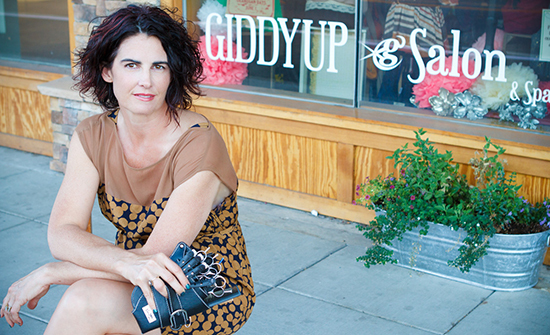 GiddyUp Salon and Spa is located at 217 S. 2nd Ave. in Okanogan. Find its Facebook page at https://www.facebook.com/pages/Giddyup-Salon-Spa/123938697661636?ref=hl. Learn more about the SBDC or find an advisor near you at http://www.wsbdc.org.